On SS2018, Shiseido changed the formula of their major sunscreen, Anessa. Shiseido Anessa Medicated Whitening Essene Facial UV Sunscreen Aqua Booster was changed to Anessa Medicated Whitening UV Sunscreen Gel N. In SS2019, they keep the formula of 2018. I decided to buy the gel/ cream of Anessa for my using. I wear some kind of sunscreens for almost 365 days for one year, but in Winter, I wear long sleeves and high-neck products. But in Spring, I wear round collars, or opened collars. I need something for my body. Before talking about the product itself, I show you the current package and design. Please pay attention at some online/ offline stores in Japan, they are still selling the formula of 2017 or before. In the formula of 2017, it was silver, but before of that, there were a white package, as I remember. This is the newest product dealing in 2019. Anyway, it is the reason why I chose this Anessa, what is I did not satisfied with Allie Highlight gel, due to the glitters. I wanted to have something better product. Summarising how I felt, simply I don’t welcome the scent of Anessa. And the waterproof effect is not enough I found. I have used years Anessa products, they are not bad products for my using, as in years, there were many stinky sunscreens, and the smell of Anessa is not pretty bad. However after I know Addiction Skin Protector, the no perfume, no stinky sunscreen I can not bear the scent of Anessa. This is the reason why I had switched to Allie for my daily and body sunscreen. 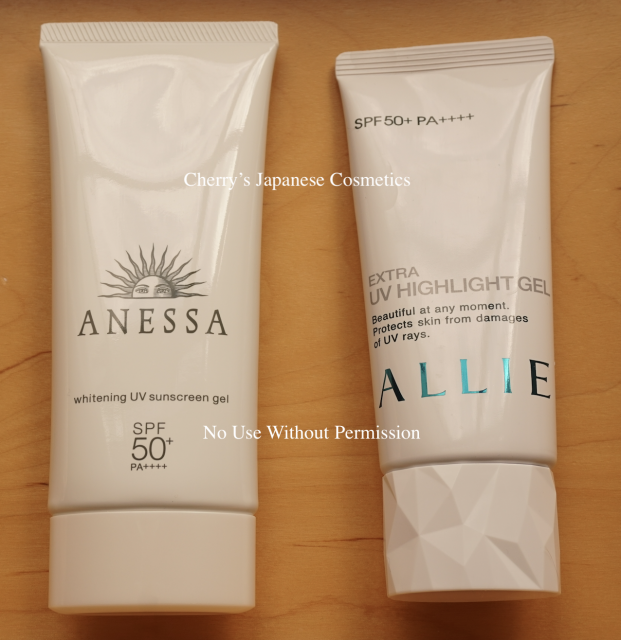 Let me swatch with Anessa Whitening UV Sunscreen Gel and Allie Extra UV Highlight Gel. Also I could not show you the glitters of Allie… But guess you cans the difference of the textures, and please look the pictures with the water drops! I sprayed Avene Water. In Allie side, water was more repelled, but Anessa side, water was more fitted. Their waterproof effect is working, but Allie is better, I felt. I just remind when I was a student, my school pool was outdoor pool (it is common in Japan, and we can swim only in Summer), we wear sunscreens, of course. Our body and face changed white because of water. But in these sunscreens, there are no worry. Pro; No Perfume, and looks better waterproof. Pro;Brightening factor of Tranexamic acid. Con; Perfume, and not good waterproof. My facial skin is not tough, I have no idea to use them on my face now. Both are not perfect for my using. Guess, I should buy Allie Extra UV Gel or Extra UV Facial Gel for my body. 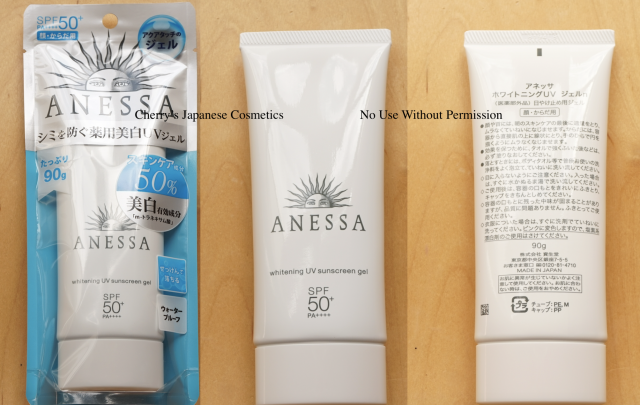 Please check the latest price, and order from here: Anessa Medicated Whitening UV Sunscreen Gel N.